Board slotting is the least invasive, and possibly the strongest way of rehinging detached boards, the most common failure of book structures. Christopher Clarkson invented the technique in the late 70’s. In board slotting, an angled slot is cut into the spine edge of a board to the precise thickness of the hinging material–often laminated linen or cotton and tissue. The slot does not disturb the turn-ins, the pastedown or the covering material. When the hinging material is inserted, the thickness of the board is maintained, eliminating unsightly creases that can arise with traditional rebacking. It is also much faster than traditional rebacking. It is an extremely useful technique for a wide variety of book structures. A machine is used to accurately cut a slot at an angle into the book board. Then a hinge can be inserted and attached to the spine. FIG. 1. 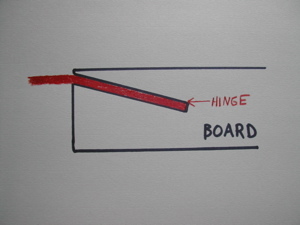 Diagram of slot and hinge in board. Generally Aerolinen or Aerocotton is used. 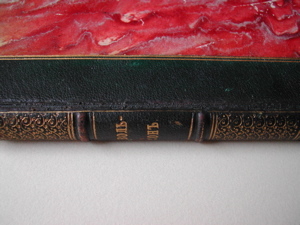 The hinge can be toned, then the original spine replaced. The repair is generally quite sympathetic, doesn’t change the position of the board on the textblock like lifting does, and is visually honest, like a small scar along the spine. FIG. 2. Close up of completed book.